See Portland as it is meant to be seen with a 6.5-hour city sightseeing and river cruise combination tour. Take a lunch cruise on the Portland Spirit, seeing the city of Portland in a whole new way while enjoying a delicious lunch. After lunch, be picked up by your professional driver and guide and see the best that Portland has to offer from a private vehicle. Learn about the history of Portland and some of its notable residents. See downtown Portland, the Pearl District, and Nob Hill, then visit Pittock Mansion, Lan Su Chinese Garden, and the International Rose Test Garden. You will experience this tour with up to 13 other people. 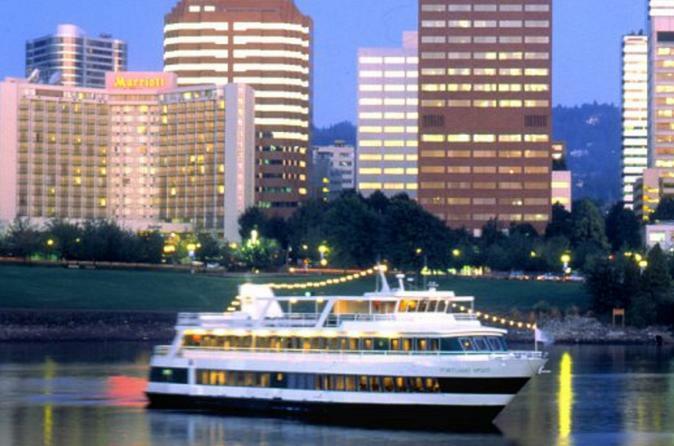 Tour begins with pickup from your Portland Spirit Lunch Cruise. Transportation to the Portland Spirit from your hotel is not included. Take in stunning views of the downtown city skyline. Make sure to have plenty of memory on your camera to capture the breathtaking sights from the unique vantage point on the Willamette River. Complete the festive day on the water with live entertainment and performances. Lunch is comprised of fresh, locally sourced items prepared on board. Includes a plated lunch entree selected by each guest, bread, fountain soft drinks, iced tea, coffee, and hot tea. Appetizers, desserts and other beverages from the full service bar are available for additional purchase on board. At the end of the cruise, be picked up for a best of Portland city tour. Don't just see the highlights of downtown, your guide will give you a well-balanced overview of both downtown and surrounding area history, culture, current events, and a representation of cultural diversity in the state of Oregon. Travel through the various parts of the city from downtown Portland to the Pearl District and Nob Hill, local neighborhoods. Visit all the must-see attractions including the Pittock Mansion, Lan Su Chinese Garden and the International Rose Test Garden. Head first to downtown Portland and enjoy the sites of Pioneer Square. Learn about the great diversity found in Portland's downtown area, the historical importance it has played in the state's history, and the fast-growing culture that exists in the city of Portland. Make a stop at Pittock Mansion. This meticulously preserved architectural landmark symbolizes Portland's transformation from a small lumber town into a bustling city. Home to the Pittock family and their descendants until 1958, the house opened to the public as a museum in 1965. Next visit the International Rose Test Garden. Let the fragrance of over 550 different varieties of roses delight your senses as you explore the lush and beautiful Washington Park. Continue your exploration of Portland's greenery with one of Portland's greatest treasures and most interesting sites to see, Lan Su Chinese Garden. Built by Chinese artisans from Suzhou, it can be considered the most authentic Chinese garden outside of China. Tour concludes with drop-off at your hotel (or the central meeting point) at approximately 5:30pm.